Oklahoma State Rep. Derrel Fincher met with Collinsville residents Saturday afternoon at the local library Feb. 2nd. State Rep. Derrel Fincher will speak at a Town Hall at 3:30 p.m. Saturday, Feb. 2, at the Collinsville Library, 1223 Main Street in Collinsville. Fincher, R-Bartlesville, said the Town Hall will give him an opportunity to meet constitutions, hear their concerns and ideas, and discuss the upcoming legislative session with them. 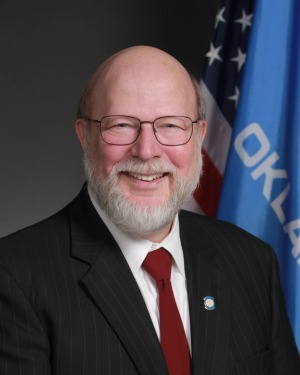 Derrel Fincher serves District 11 in the Oklahoma House of Representatives, which includes Rogers, Tulsa and Washington Counties. He can be reached by phone at (405) 557-7358 or via email at derrell.fincher@okhouse.gov. I just finished my first week of the legislative session, and we had a great start. Newly elected Gov. J. Kevin Stitt delivered an optimistic State of the State address. He proposed his vision of making Oklahoma a top-ten state in several areas, including education, health care, jobs and business growth, and criminal justice reform. I support those broad goals, but we all know that we will not be able to make those changes overnight, or even in this session. We also know there will be hard work ahead as we refine the vision and set budget priorities. Of course, now the fun starts. Legislation must still be passed by the two chambers of the Legislature  the House and the Senate. The next four weeks will primarily be dedicated to hearing bills in committee. Once a bill passes committee, it is eligible to be heard on the floor of the chamber where it originated. The House Common Education and Public Health Committees as well as several others heard their first bills this past week. (Appropriations and Budget Subcommittees started work two weeks before session.) Now those bills could be considered by the entire House. Once a bill passes in its chamber of origin, it goes to the opposite chamber where it must pass again through a committee and then that full chamber. If there are any changes, the bill has to go back to its chamber of origin for another vote. If a bill makes it all the way through the process, it must still be signed by the governor before it becomes law. The budget is a good example of how the process works. While Governor Stitt did present a budget proposal, that was just a suggestion. In Oklahoma, the House creates the budget, and then the Senate also approves it before it goes to the governor. Of course, the House has to work with the Senate while drafting the budget legislation because the House needs to create a budget the Senate will pass. And it also to be needs to be something the governor will sign, which means the House also needs to communicate with the governor while writing the legislation. And there is good news on communications with the governor  he has actually been over to the House side to speak with House members and is inviting us to breakfast in small groups to talk with him. Now for some numbers, because what is an update without a few numbers? A total of 1,733 bills and 21 joint resolutions were filed in the House this session. The Senate filed 831 bills and 46 joint resolutions. Not all of these will be advanced, but you can see how we will have a lot to consider ahead. In the coming weeks, I will update you on specific legislation and tell you where we are in the legislative process. If you live in my district, and have an idea, a question or a concern, I can be reached by phone at (405) 557-7358 or via email at derrel.fincher@okhouse.gov. The 2019 legislative session kicked off this past Monday. The spotlight that first day was the Governors first State of the State address. He touched on issues where I think theres going to be common ground for members on both sides of the aisle, but its reasonable to expect there will be differing opinions on the best way to accomplish the goals we agree on. Its all part of the process. Now the gears have shifted and the spotlight is back on the Legislature. Before any bills can be heard on the floor of the Senate, they must first be approved in committee. This week I presented two of the measures Id filed ahead of the sessionthey were heard in the Senate Education Committee. During the interim, I requested a special study to look at the issue of vaping in our schools. These e-cigarettes have been marketed as a way for adult smokers to cut back or even quit. But kids have increasingly been using themeven in school. Some of the devices look like a flash drive. They come in flavors teens enjoy like menthol, mint, or even candy flavors. They are easy to hide, and students can exhale the vapor into their backpacks or even special sweatshirts made for exactly that purpose. Heres the problem. They still contain nicotine. Some cartridges can contain as much as youd get from an entire package of cigarettes. While nicotine carries health risk for anyone who uses it, its especially harmful for kids. It can cause damage to their still developing brains that can impact their ability to learn. Other chemicals in e-cigarettes can cause lung disease. Kids think that, unlike cigarettes, its safe for them to vape. Its simply not true. Unfortunately, current law doesnt address this product. My legislation would amend Oklahomas Tobacco Free Schools Act to include vaping. My legislation would ban the use of these products in any building or vehicle owned by a public or private school. I also won approval for another bill to repeal a requirement for schools to file reports on all physical activity for students. I applaud the goal of promoting increased physical activity as a way to combat childhood obesity and promote better health. But our educators are already buried in paperworkmany schools werent following this requirement anyway. Lets let our schools and our teachers teach. Im gratified my fellow members agreed with me. Both of these bills will now move to the full Senate for further consideration. I welcome your comments on state government and the issues before us. Please feel free to contact me by writing to Senator J.J. Dossett at the State Capitol, Room 521-A, Oklahoma City, OK, 73105; call me at (405) 521-5566.